A SCRUFFY Cruella de Vil lookalike was involved in a plot to steal pedigree dogs from a breeder. 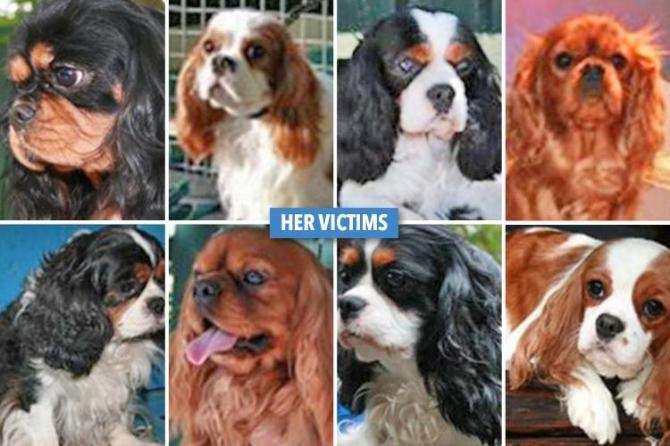 Bridget Darling, 40 — who has two-tone hair and wears a fur coat like the 101 Dalmatians villain — was nabbed with 11 King Charles spaniels in her three-bed semi. She and husband Barry, 51, were also involved in the theft of at least four more pooches — in cahoots with Barbara Petrie-Harrison, 45, and her lover Craig Jackson, 42. Petrie-Harrison had bought a spaniel from breeder Madeline Cowling but later broke into her property in Market Rasen, Lincs, with Jackson to steal 15 dogs worth £6,500. The spaniels — one of which was pregnant — were then passed on to Barry Darling in Birstall, West Yorks. But cops were able to connect a car seen on CCTV in the area — a black Vauxhall Astra — to the Darlings. The investigation following the theft in September 2015 led to the arrest of all four. Judge Andrew Easteal ridiculed the defendants at Lincoln crown court, saying: “Let’s be clear, this was as deplorable and awful as it was amateurish and doomed to fail. Both Darlings admitted handling stolen property. Petrie-Harrison and Jackson, of Basingstoke, admitted burglary. They all got suspended prison sentences of between 12 and 16 months. But despite the convictions, the dogs could not be returned to their owner because they did not have microchips. Ms Cowling said: “This is two years later and I am still very anxious. I just wish they could tell me where my babies are. Earlier this year, analysis of crime stats by an insurance firm put Lincolnshire as the dog theft capital of Britain. Dog-nappers Craig Jackson and Barbara Petrie-Harrison.